Toward the end of the Middle Ages, many of the large cities of the Netherlands had bought or won charters giving them many rights of freedom, but when Charles V came to the throne of Spain he disregarded these charters. When Calvinism spread over the Low Countries he introduced the Inquisition and tried to root it out. Philip II of Spain increased the persecution. The people rebelled in 1566 and the Duke of Alva was sent into the country to put down the rebellion. The people elected William of Orange as their leader, and the Dutch Revolt began. The war lasted for forty years with varied fortunes. The Prince of Orange was assassinated in 1584, but the struggle went on under his second son, Prince Maurice, a boy of seventeen. First England and then France came to their aid. Finally in 1609 a truce was established which ended in the acknowledgment of the provinces in 1648 as one of the provisions of the Treaty of Westphalia. The declaration given below -- the first in modern times -- brings forward prominently the great idea that rulers are responsible to the people and can be deposed by them. The growth of this idea is center of the development of constitutional and republican government. 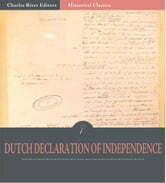 The Rise Of The Dutch Republic, Introduction I. The Revolt Of The Netherlands, Book III. 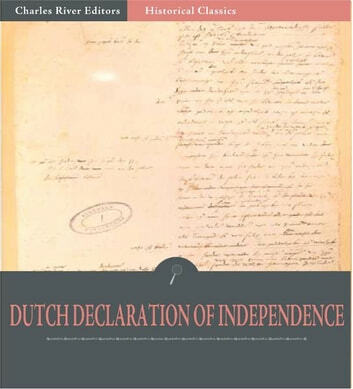 The Rise Of The Dutch Republic, Introduction II.